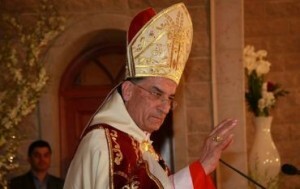 Maronite Patriarch Cardinal Mar Bechara Boutros al-Rai slammed on Sunday the bickering rival Lebanese politicians , held them responsible for the numerous explosions and security incidents plaguing the country and prayed to God to enlighten their minds. “Political parties which refuse to reconcile with each other and understand one another , and those who are obstructing the formation of a new government and threatening or planning for presidential vacuum are responsible for all these crimes,” Rai said during his Sunday Mass at the seat of the Maronite Patriarchate in Bkirki. The purpose of the government should be to take of the human beings and not portfolios, he said in a veiled reference to Free Patriotic Movement leader Michel Aoun who has been dubbed as the last person standing behind the failure to form the cabinet. Aoun has rejected a deal reached between rival parties on the rotation of portfolios in a 24-member cabinet based on the 8-8-8 formula. “Let’s pray that the Lord enlightens the minds of our officials so that we could overcome the crises,” Rai said. It said it was to punish Hezbollah for fighting alongside forces of Syrian President Bashar Assad. Rai said it is the duty of the patriarchate to issue a national charter on the occasion of St. Maroun. The document, which is expected to be issued following the monthly meeting of the council of Maronite bishops on Wednesday, holds onto the national principles and sets the priorities for a better future, the patriarch said. The charter is based on three factors – national principles, concerns and priorities – Rai said earlier this week. That is what the Lebanese folks been doing since the creation of Liban! Need a lot of ‘Enlightening’, Rai … ask for some for the Religious Fatheads too. The maronites patriarch prays for peace, understanding, tolerance, and respect amongst the different people’s and politicians, on the other end of the scale there are religious leaders inciting revenge, killing, threats, fatwas for jihad licencing and approvals. Ummmmmmm, if the scale is weighing up good vs evil, then it’s not hard to see the picture here. He’s also blessed with a brain..the only intelligent brain..in Lebanon mess. You don’t pray for peace, understanding and tolerance and go call a guy like bashar “reformist”. So far this patriarch has done nothing worth mentioning. He talks, talks but he didn’t come up with anything, not for the Christians, not for the Lebanese. Maybe you should do it..